Trisha Wolfe is the author of the YA Steampunk/Paranormal Romance DESTINY’S FIRE. Her published short stories have appeared in YA literary journals and Fantasy magazines. UNVEILED is her first novelette and part of a Dystopian series releasing TBA. She’s written four books in the past two years, and is currently working on the sequel to DF and a new Sci-fi project. She’s represented by Lauren Hammond of ADA Management. For him: Steampunk Cufflinks. These are so cool! You can find them on Etsy here, and for around fifty dollars your man could be styling them for you this Valentine’s Day. For your lover: Original artwork by Brian Kesinger in this Valentine’s card that reads: “Together we have built a great relationship”. You can order it at Clockwork Couture. For him: Tender Time Bomb Tie found at Etsy. Your guy will look dashing in this micro-fiber silk tie that you can you can have customized for him. For anyone: Make your own awesome Valentine’s Day cards! Buy the cardstocks and follow the directions at Inkadinkado to make these beautiful designs, or create an original one of your own. For her: Steampunk Valentine Heart Ring, Key to My Heart. This ring is solid brass, romantic, and I think it’s the perfect Valentine gift. *swoons* You can find it at Etsy. Welcome to the holidays! Now that we’ve passed Thanksgiving, it’s time to think about decorating for the holidays. So what can you do to add a little steampunk flair to your decorations? More than you think! Christmas trees lend themselves well to steampunk! After all the Victorians loved celebrating Christmas. 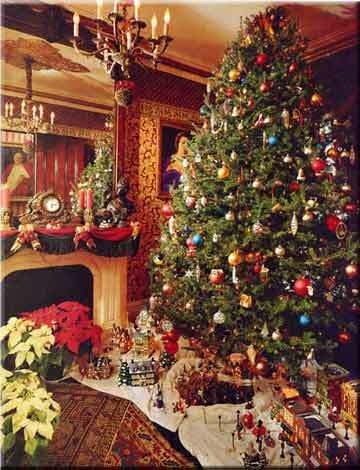 Try decorating the tree with a mixture of old-fashioned Victorian elements. For example cameos, watch parts, gears, rusted springs, snowflakes made out of bent copper wire, well-dried gingerbread with hard icing details, tassles, scrolls of old sheet music or old keys hung using thin velvet ribbon rather than wire hangers. Consider using ribbon, lace, twine or thin copper colored chain as garland, or even go back to the very basics and make a paper chain or popcorn and cranberries strung on a string! Add color with bits of holly, or scent by tying little bunches of cinnamon bark with ribbon to the tree. To give a tree a more mad scientist feel, use larger lights or put candles in test tubes and beakers. It’s easy to decorate a traditional tree with a mixture of old-fashioned Victorian ornaments such as candles and steampunk accessories – bunches of keys, watch parts etc. For a mad scientist look, stick the candles in test tubes and beakers and use clear glass ornaments or even small glass canning jars filled with various objects (silk flowers, artificial insects) for a more “naturalist” appearance as if you are keeping the little things for observation. If you really want the more industrial steampunk look, go ahead and paint an artificial tree copper or gold, or construct one out of copper piping, using dials and gauges for ornaments and threading wire through the pipes so you can still light it up. 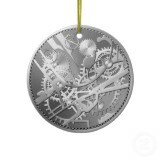 And of course you can always choose steampunk ornaments for additional flair. It was incredibly common to have displays of items from ones experiments and travels housed beneath domes of glass or inside a glass-in shadowbox. For Christmas, consider making a Victorian Naturalist Display of your own featuring anything from the silly to the sublime. Create a display from things such as holly, bits of fir boughs. An artificial cardinal or other song bird. A string of pearls, a Christmas cookie, or gingerbread man. 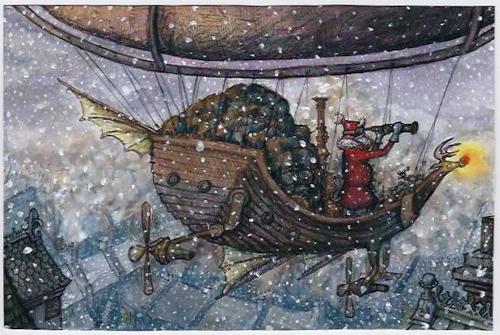 A lump of coal from Santa for bad little boys, a feather from a Christmas angel, or even a reindeer antler. One of the things children love best (and really, aren’t adults just big children at Christmas?) is an Advent Calendar. 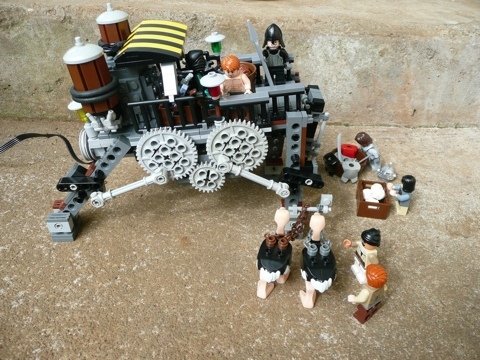 Create a steampunk version for you and your family. There’s lots of options. Create little felt pouches with a number on each pouch (1 to 24), string them along a bit of twine and tie ribbon or red and white gingham bows in between and, then put a treat in each pouch and string it along a banister, mantle or wall. If you’re looking for a more mad science approach, arrange a series of 24 glass containers (jars, beakers, vials) on a surface such as a mantelpiece, or bookshelf and tuck a treat inside each (such as a small hard candy, peppermint, or individually wrapped chocolate – I personally love the Giradelli chocolates for this.) Use fir boughs, Christmas ornaments, gears, watches, small bird cages, chains, etc. to decorate around the glasses. You can either hang a label on each container with the numbers or get those brass house numbers at a hardware store and prop them up or hand them on the containers. Sure you can use your regular green wreath and steampunk it the same way you did your tree, but you can also go bolder. Create a wreath from “gears” by brushing gingerbread cookies with metallic food paint. Wrap it with wire, or put in a few glass bulbs of different types. Use old typewriter keys to spell out “Merry Christmas” or cut out letters from different large fonts and “paste” it together for a more typeset look. For a more naturalist look, consider finding a wreath create from grapevines, or similar twigs. Add holly or berries, or a gingerbread man. Perhaps a small ornamental song bird. Scrolls of Victorian sheet music, and rich velvet ribbon. 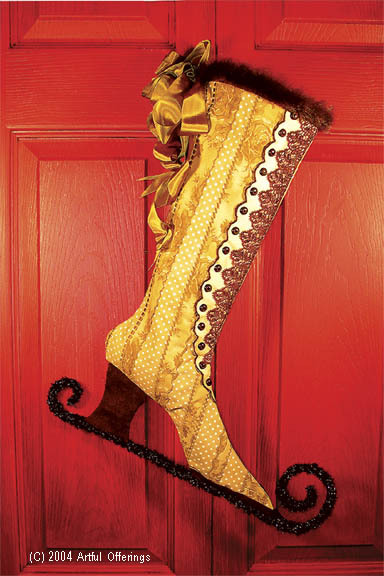 Victorian’s loved their Christmas stockings! In fact, some times, there were no presents beneath the tree, they all came in the stockings “hung by the chimney with care”. If you don’t feel like searching out for a stunning Victorian boot stocking of your own, or an elaborately long striped stocking for fun, you can always make one as well. Buttons, lace, gears, keys, tassels. There’s no end to what you can do. Decorating for a steampunk Christmas is no different than the attention you put into your costume or the artwork you create. Just take what you know, what you love, and add a dollop of imagination. 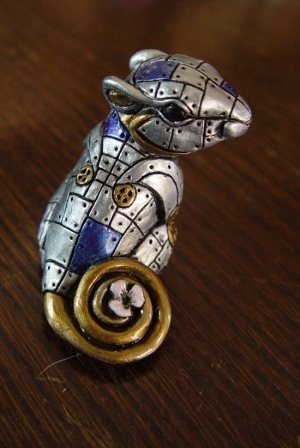 ‘Twas the night before Christmas, and all through the house, not a creature was stirring, except a clockwork mouse. 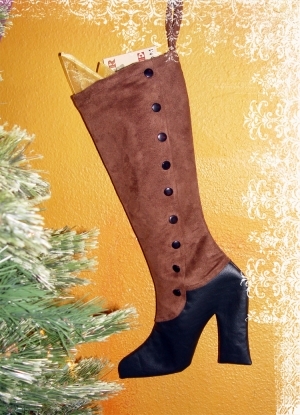 And check out these stockings (already pre-filled with delightful steampunk goodness) that you can hang by your chimney with care. My suggestion is you skip the milk and cookies and leave St. Nick what he really wants–a steaming cup of something hot, like some real English Christmas tea. Ok, perhaps leave him shortbread cookies too. 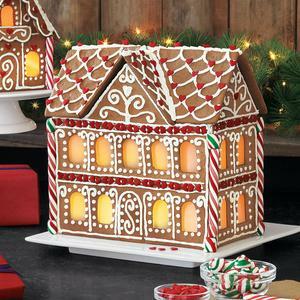 And for steampunk sake, why make an ordinary gingerbread house when you can create a victorian gingerbread manor house instead? May you find the perfect things for your holiday festivities and enjoy the season with family and friends!